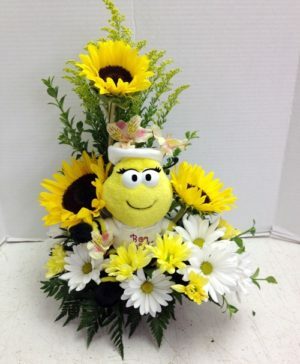 This very happy Bee sits atop a stunning floral arrangement and says, “Get Well Soon Bee” with a smile on his face and cheerfulness in his eyes! He’s hard to resist! 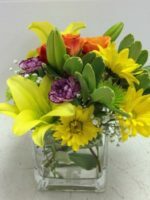 Sunflowers and daisies complete the arrangement, with a little bit of white or yellow accent of solidago, alstroemeria or carnations. There’s no doubt this Get Well Soon Bee will help speed up the recovery just a little bit! You might prefer a great Get Well Soon Fresh Fruit Gift Basket or our Bee Well Buzz Bouquet! That looks so amazing. Thank y’all so very much. I really do appreciate it. 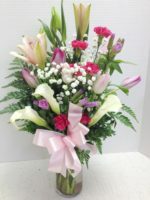 Well Flowers you sent to her the other day!! This is a great testament to a terrific happy flower assortment (and a very pretty girl, if I say so myself! ).